I am not an Easter Egg! Tomaghost: I'LL MAKE YOU PAY FOR PAINTING ON ME, YOU STUPID IMP!!! Remember how I said that there'd be a few SFW drawings during the Easter theme? This is one of them. And Tomaghost isn't all too pleased with Thysted painting him like an Easter egg. 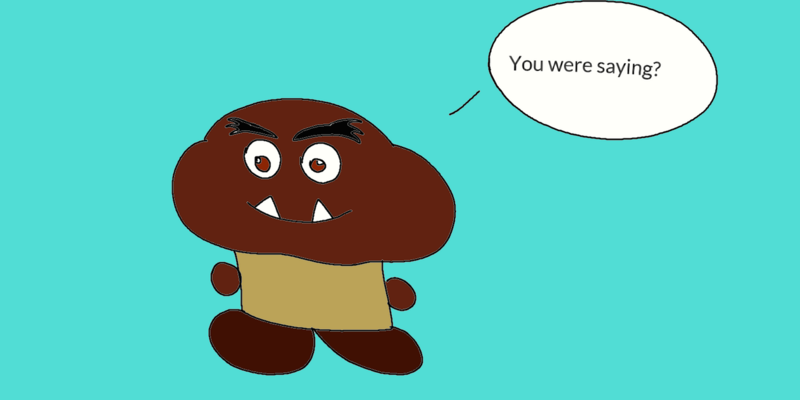 While strictly not a drawing having to do with the "Easter" theme, I couldn't help myself with drawing this after stumbling upon this interesting article on the Daily Dot regarding Goombas. At first you may be in a stage of denial, but then you'll slowly build up some intrigue as you continue reading. Easter is slowly nearing and Thysted has still grown a little impatient about when his request of a chocolate egg would be done. That's right, this is a request that has been made by ThystedMind a numerous amount of times, but finally it is finished. And Eggitha White has found herself in a bit of a conundrum after dealing with a group of dishonorable "assassins in training". I won't go into full detail about what happens, but expect a story to come out explaining why soon on ThystedMind . 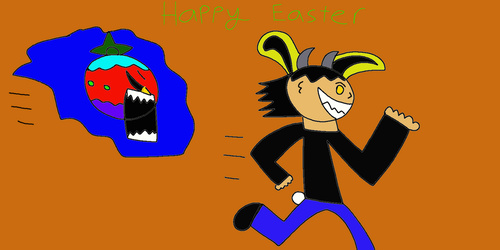 We're off to a great start when this starts off the series of Easter themed drawings, aren't we? Okay I am going to be honest with you; it's not my greatest drawing centering on the Bunnyman (more specifically the one featured in Carl Lindbergh's "Bunnyman" trilogy), but better to attempt something than attempt nothing. 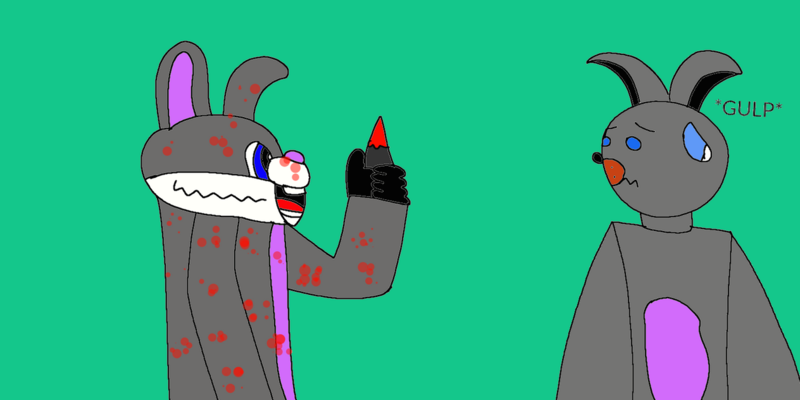 But don't think the Easter drawings I am drawing are just going to have a macabre theme. Quite the opposite, actually. There'll be a few SFW, a few NSFW, a few comedic ones, and so on. After having to put up with being forced to consume an absurd amount of chicken, Jackie and Tammitha finally deliver a sense of irony to their tormentor, Bok Bok. As stated before in a previous drawing, this will be the last time I ever draw "Bok Bok". In the meantime, expect a few Easter themed drawings (sort of). Just your average everyday individual who has a knack for drawing the most random of things that come to their mind (unless stated otherwise). If you feel like communicating and/or hanging out with my "dark side", go to ThystedMind . Otherwise there's this account and RHGProductions . Come look at my gallery and fave the new stuff.